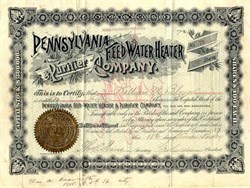 Beautiful certificate from the Pennsylvania Feed Water Heater & Purifier Company issued in 1889. This historic document was printed by Wm.P.Murphy & Sons and has an ornate border around it with a vignette of the company's name. This item has the signatures of the Company's President and Secretary and is over 116 years old. Small tape repair on back. Diagram of company's product on the back of the certificate.